One of the basic needs for every human is safe and healthy food. This is where organically grown foods come into focus. They are not only safe for health but also contain the essential nutrients for the body. In the rush to produce more and more crops to satisfy growing demand producers have had to resort to using a lethal cocktail of pesticides to control plant disease and insect attack. Organic food refers to food items that are prepared according to the norms set by an organic certifying body. Organic food is food prepared and processed without using any chemicals. This means, organic food production does not involve the use of chemical fertilizers, chemical pesticides, chemical preservatives, etc. They are increasingly becoming popular due to their perceived health benefits over conventional food. If you are looking for foods that are better for your health, then organic foods are a great way to get vitamins and minerals without putting anything in your body that could potentially damage your health. 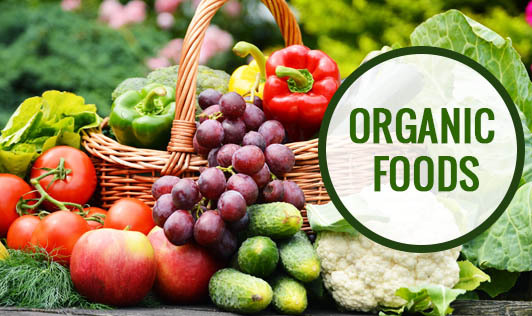 Popular organic food items include organic tea, organic coffee, organic milk, organic honey, organic vegetables, organic fruits, organic rice, organic corn, organic herbs, organic essential oils, organic coconut oil and olive oil. • Often, the flavour is just so much better. Good organic fruits and vegetables are juicy and full-flavoured, milk tastes richer, cheeses are ripe and mouthwatering. • One of the huge advantages of organic foods is that they haven't been doused in pesticides. • Organic foods might be more nutritious, richer in vitamins, minerals and essential fatty acids than non-organic. • More nutrients are retained as most of the organic foods are grown and sold locally. • Organic foods are much easier for the body to digest and process. It is not full of additives and fillers like most processed food, and the body can move it through the digestive system much easier. • At the mument organic foods are too expensive when compared to other food products that use pesticides and genetic engineering, because of crop failures since farmers cannot use any chemicals like pesticides. • Most organic foods have a shorter shelf life than non-organic food products as preservatives are not used.